To avoid damage and/or septic system backup or breakdown, septic system pumping is absolutely necessary. We pump approximately 400-600 septic tanks annually and take appointments Monday through Saturday from 9am – 5pm ET. For an average tank, a septic pumping usually takes 30min – 1hr. Most problems with the septic systems are caused by not pumping enough. At a minimum, septic tanks need to be pumped every two to five years. However, depending on the type and size of septic system and your lifestyle, eating habits, chemical use, etc., you may need pumping more frequently. Get your septic tank pumped when sludge (the semi-solid waste that settles on the bottom of the tank) builds up to 25% - 30% of the tank. 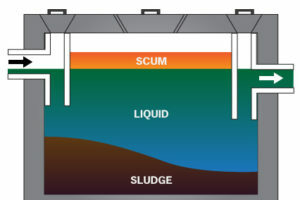 We can measure both the scum and sludge layer (shown below) to help you gauge how often you should pump your septic tank based on your lifestyle. Regardless of the pumping frequency, you should get your septic system inspected often – typically on an annual basis. This way you can pre-empt larger problems. How much does it cost to pump my septic tank? A typical residential septic tank holds between 1,000 and 1,250 gallons. We charge a fixed rate of $325 for the first 1,000 gallons and then a prorated rate for every 250 gallons after that. Ask about our "Septic System Maintenance Plan" and get a discounted rate.